This is a very small vineyard – 0.4 ha. We keep the crop very low, only allowing one bunch per shoot. The rest we sacrifice to the soil, the porcupines and mountain buck. The porcupine in particular have a feast. Then we only bottle this wine in the rare years when it is spectacular. In years when it’s just great, we don’t bother. Many consider this single vineyard offering the essence of The Drift farm. We agree that it is an intriguing, delicious wine that quenches both physical and mental thirsts. The 2015 vintage reflects the incredibly fortunate weather we experienced during the ripening season. A cold, wet winter in 2014 (even some flooding) was followed by a perfect spring, with less wind than normal at flowering time, which is good for fruit set, giving us bunches to work with. Then the wind started blowing in early October and didn’t let up, ensuring the vintage was bright, but much cooler than normal, with only 22 days in the whole year above 300C. As usual the nights were always cool, ensuring that famous Barbera natural acidity remained intact, guaranteeing the captivating freshness this wine is famous for. The grapes “cold soak” for a few days before “wild” fermentation kicks off, the party taking place in open top fermentors – 50% whole bunches. The excitable cap is gently hand plunged 5 or 6 times a day. Once complete we press to mostly old 225lt barrels for between 18 and 24 months. The finished wine is neither cold stabilized, fined nor filtered. While enjoyable in youth, the wine will live for at least 20 years if stored correctly. The wine is densely purple in colour. It’s a full-on nose, packed with concentrated black types of fruit like mulberry and ridiculously ripe cherry. But it’s the spice and herbaciousness that marks this wine as different. 2015, being a cool year on The Drift, means the fynbos and garden herbs are central, but in the background like good double bass player should be. This allows the wine to show an explosion of dark, black, inky fruit on the palate. The wine is rich, but fresh, with clean, refreshing acidity and soft, luscious tannins. If cellared correctly this vintage will live for twenty years easily, but is drinking very well now because of the softness of the wine crafting. This is an extraordinary wine. I have enjoyed this wine with vitello tonnato as well as grass-fed rib eye with a dusting of pepper. For many this is the essence of The Drift Farm. The nose shows an intoxicating explosion of super ripe mulberry, black cherry, ripe plum, white pepper and fynbos herbs (especially Buchu). The palate echoes this intensity and unctuousness with rich, black mulberry, a hint of creamy caramel and savoury, wild fynbos herbs adding a nice salty note. The tannins are comfortable but present, offering a warming structure that balances the mocha vanilla of the wood. This wine benefits from being decanted a day or two before consuming. It will age gracefully for at least 20 years if stored correctly. 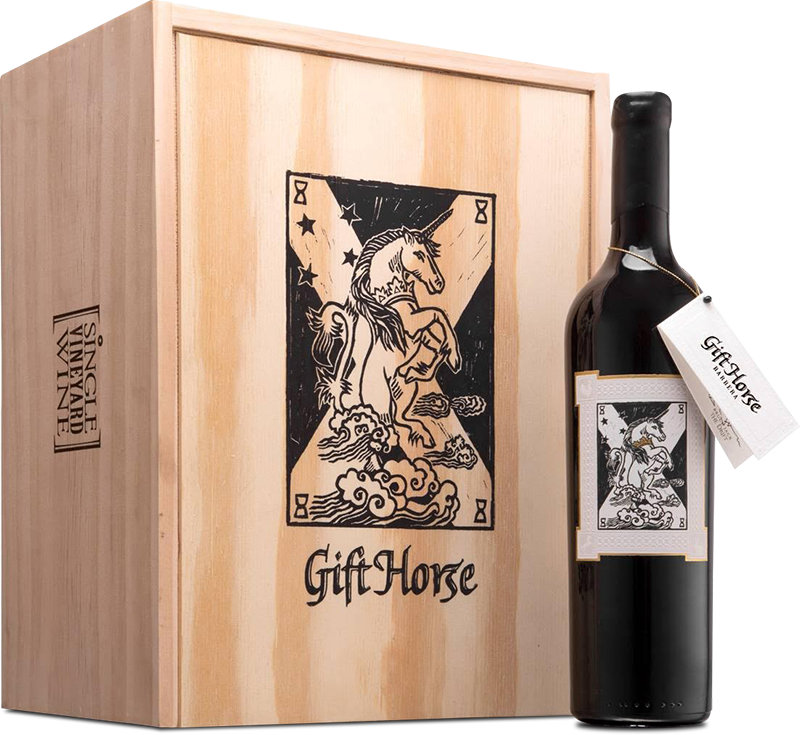 The maiden 2013 Gift Horse is a pure Barbera, a variety not associated with South Africa. It comes from the only registered single .33-hectare vineyard dedicated to Barbera in the country that produces between one and two tons per year. It is made with 25% whole bunch with stems to get a bit of carbonic maceration. Deep purple in color, it has a very aromatic nose filled with blackberry, incense, dried violets and intense fynbos scents that speak of the place. The palate is medium-bodied, sensual in the mouth with fine tannin and well judged acidity. There are hints of white pepper, white fennel and Chinese five-spice infusing the black and red fruit, seguing into a beautifully composed finish. A quite astonishing and unique wine, though afford it several hours decanting, or even don’t be afraid to open it the day before.